Of the hundreds (thousands?) of video games I’ve played, there are relatively few I’ve completed the storyline of. Among those, I count Tomb Raider: Legend and Anniversary. I had played some early Tomb Raider games on the PS1, but Legend was the first I actually got in to. Unfortunately, Underworld bored me so much that whilst I’ve started it several times, I’ve yet to play past 30% of the story. I might finish it one day. However, on to the newest game: Tomb Raider. In the absence of a subtitle, I’ll call it Tomb Raider 2013. The combat of previous Tomb Raider titles was dull to say the least. Clunky auto-aim, frustrating weapon reloads and predictable combat zones; combat in the previous trilogy has few favourable points. This had now been replaced with a refined third-person gunplay and cover system that’s as fluid and fun as Mass Effect 3’s. 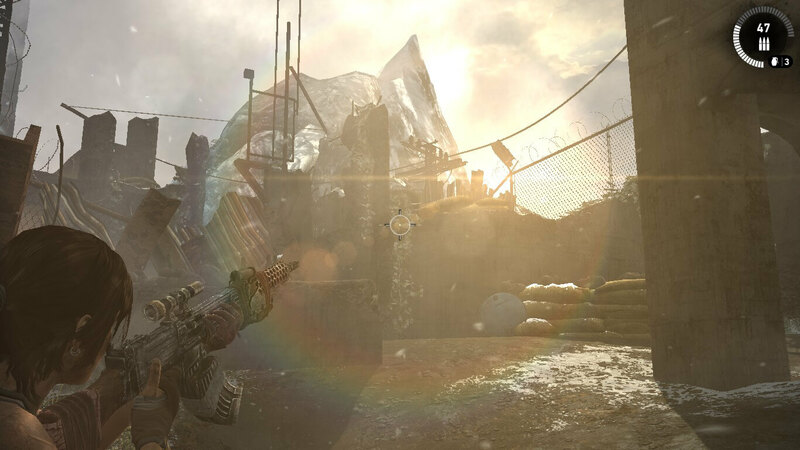 Each of the usual weapon types is found, such as the pistol, rifle, shotgun and the bow taking up the sniper role, and each can be upgraded with additions that unlock throughout the story. My favourite is obviously the bow that’s prominent in the promotional material. It’s accurate, fun to use, and the fire or grenade tip options give it a lot of versatility. 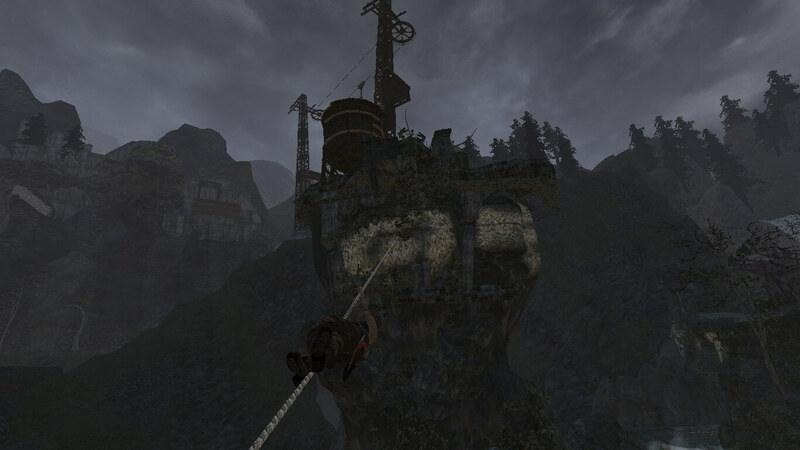 The axe used to climb and zip around the island is wonderfully used in melee combat too. Using tools for combat and exploration comes straight from Batman: Arkham City and used to great effect. One of the things I really like about Tomb Raider is that the mechanics make sense in relation to the world and story you’re playing through. Nothing feels rushed or forced. I found it easy to immerse myself in the world when I’m picking up weapons from enemies or being given them by friends. Dotted around the island are secret tombs which use physics puzzles reminiscent of previous TR games to complete. Whilst it seems a little like they were added in just to justify the “Tomb Raider” name on the box, they allow Lara to explore her archeological desires and set up what I assume will be the focus of the next game. On this note, Lara can find and investigate items spread across the island. This gives Lara the opportunity to talk about the historical origin of objects, giving you some insight into her own background and reinforces her family legacy as bold explorers. 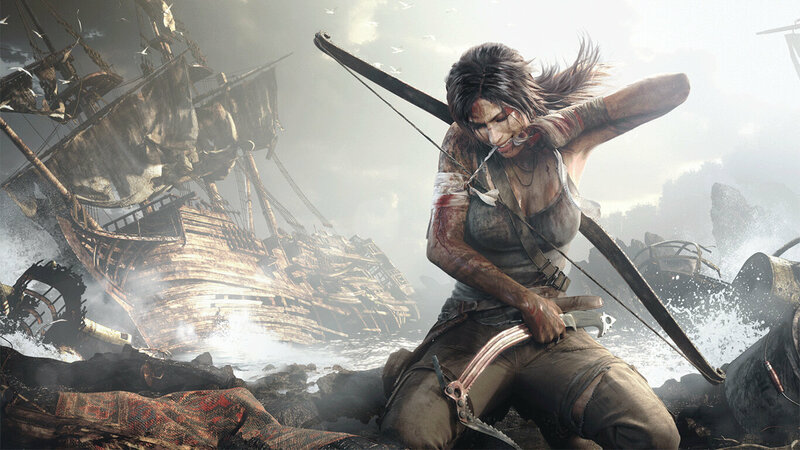 The supporting characters each have unique personalities and fulfil different roles in the narrative by supporting or hindering Lara as she tries to get her friends and herself off the island. None of the crew seem extraneous and the voice acting for each is perfect. I actively wanted to protect and save each member of the crew, and I wanted to understand the motives of Mathias. I feel as though I understand the island as well as the legends and magic surrounding it. Everything in the game has depth and believability. And then we get to Lara herself. First things first, Camilla Luddington’s accent annoys me. However, I can’t fault the emotion in her voice and, along with the motion captured animations, she really brings Lara to life. In terms of Lara’s personal progression throughout the game, I need to explain something of Rhianna Pratchett – the lead writer. She was lead writer for two other games I’ve played, Mirror’s Edge and Overlord 2; as well as some dialogue writing for 2008’s Prince of Persia. That particular Prince of Persia (can we please not name series sequels the same as original games, it’s annoying to write about them) is a favourite game of mine. The story and gameplay is very reminiscent of platform games from the Playstation 1 era such as Spyro and Croc: Legend of the Gobbos; it still feels refreshing and I love the ending, but that’s a conversation for another review. Mirror’s Edge also has a fairly unoriginal story which reminds me a lot of Jedi Knight 2: Jedi Outcast (protagonist is an outcast, betrayal, army based on the protagonist’s powers, yada yada yada…), but there’s something that just doesn’t feel tired about it. When we get to the story of the new Lara, she undergoes a pretty standard bildungsroman, but her growth is organic and inline with the gameplay. Lara improves and hardens as I play, and the ability upgrade system ties in perfectly. Lara is no longer the generic orphan character trying to find out what happened to her parents, and she’s no longer just a rounded collection of polygons on a stick without any personal growth between the start of the game and the end; Lara is a character you get to know and understand. I’ve been reading stories about Square Enix being disappointed with Tomb Raider’s sales and it leaves me worried we won’t get a sequel. However, assuming the positive reviews sing out and a sequel is produced, what should they do? They need to move away from the deserted island setting, it worked well once but I don’t think the same trick will work twice. Also, between Tomb Raider, Dead Island and Far Cry 3, haven’t we had enough of “deserted” islands with murderous inhabitants for the time being? I also don’t want Crystal Dynamics to swing back to the linear treks of previous Croft adventures. Besides bigger tombs and more physics gameplay, I don’t really know what I want from the sequel. But I feel confident that Lara is back and ready for the new generation, and I look forward to seeing what Crystal Dynamics has in store.